Some restaurants have what it takes to put out multiple courses in a lunch hour and some don’t. Habitat Restaurant in Downtown Pittsburgh has it. Their clever 4-courses-1-plate approach is genius for the downtown worker trying to get in, get lunch and go during the lunch hour. They call it the “Executive Express” lunch which is regularly priced at $18, but for Pittsburgh Restaurant Week Winter 2014 is discounted to just $14. Executive Express Lunch at Habitat Restaurant on January 14, 2014. Only $14 for Pittsburgh Restaurant Week. 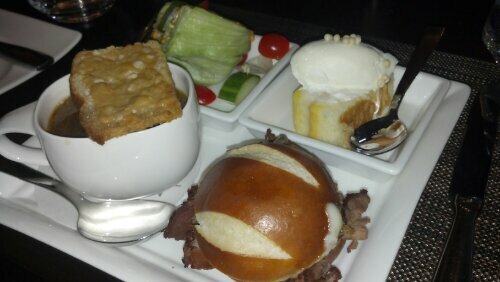 Pictured above, the Executive Express Lunch items are a chef’s choice selection of a cup of soup, small salad, small sandwich and small dessert. In my opinion, you may not find better portion control anywhere else in the city. Four courses at other restaurants take over an hour to eat and contain large portions. At Habitat restaurant, I think it’s actually quite refreshing to have all four courses served at once. Have a rough morning at the office? Gorge on the dessert course first. Best of all, Habitat takes reservations on OpenTable so you know before you leave the office what time you’ll be seated so you can plan – and if necessary shift – your lunch hour accordingly.